We’ll be altering an old book by removing the book block, reinforcing the spine, and inserting pages of our own. Use an old book you already have, pick one up at a garage sale or thrift shop, or choose one to work with from a selection provided at the workshop. We’ll make a 3-signature journal and learn the Diamond X stitch to bind the book. Part 1, we’ll dismantle and rebuild the book itself. Part 2, we’ll cut or tear papers and create three signatures. Part 3, we will bind the new journal. The fee is $45. Please RSVP as soon as possible, and send payment by Tuesday August 6 . See newsletter for details. Old book to alter, with spine no more than 1 inch thick. Various papers including scrapbook or drawing paper, magazine or catalog pages), large format picture or photo books, pages from large old journals, accounting paper, flap envelopes of any kind—pretty much any paper you can recycle/reuse. Decorative paper for insides of front and back covers. Piece of cardstock 3 inches wide and as long as your book is tall (for hole template). Book cloth tape OR contact paper OR plain or decorative duct tape for inside spine. 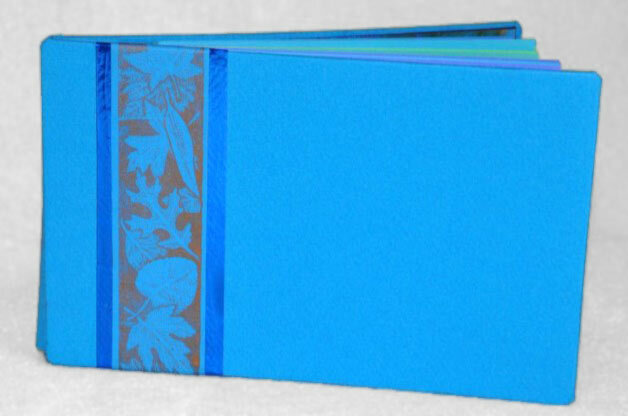 • OPTIONAL: If you want to cover the outside spine of your book with paper, bring a special piece for that purpose, 4 inches longer than the spine and 5 – 5-1/2 inches wide. OR you can use contact paper cut to the same size as above. OR if you want to cover the outside spine with fabric, then cut a piece of fabric the size specified above, glue it onto paper smoothing it down to get all the wrinkles out, let dry completely. Or you can fuse the fabric to paper, which I prefer over glue. 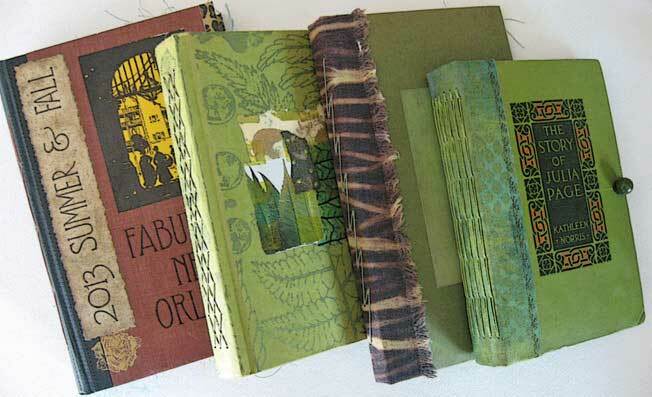 In either case, bring the fabric/paper/contact paper strip to the workshop ready to glue onto your book. • Extra papers/pages. 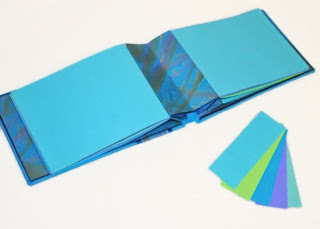 You’ll need between 15 and 24 papers to fold into folios. Bring 15 and use some of Connie’s if you need more. • Decorative duct tape (Duck brand). If you want to buy your own, Michaels has the biggest selection, also Ace Hardware. • Contact paper. Also available at Ace if you prefer your own. More detailed info will be emailed when you pre-register for the workshop. 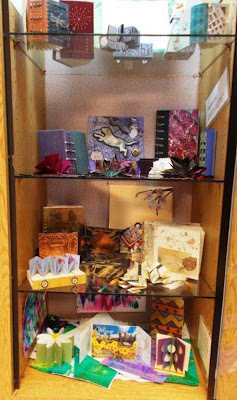 This month's Humboldt County Library display contains examples made by NORBAG members at workshops held out of the area. 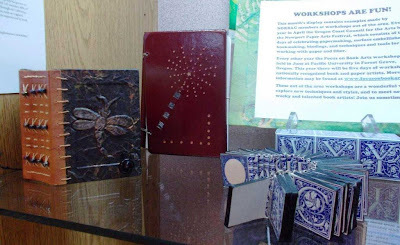 Every year in April, the Oregon Coast Council for the Arts holds the Newport Paper Arts Festival, which consists of three days of celebrating papermaking, surface embellihsment, bookmaking, bindings, techniques, and tools for working with paper and fiber. Focus on Book Arts (FOBA) workshops are held every other year in June at Pacific University in Forest Grove, Oregon. 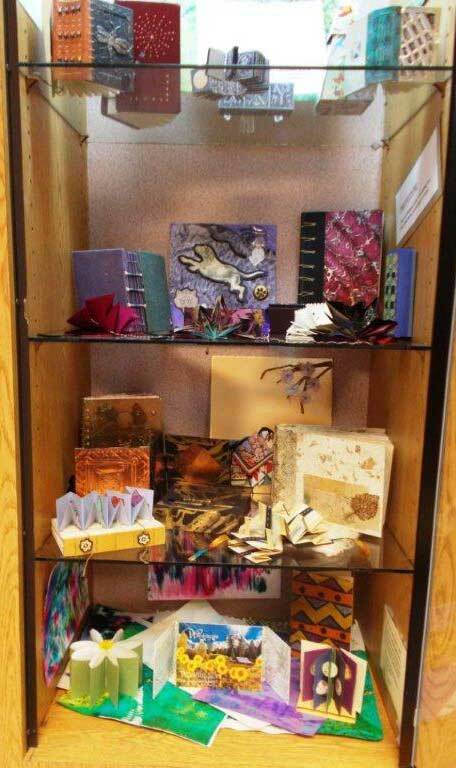 This year there were five days of workshops taught by nationally recognized book and paper artists. 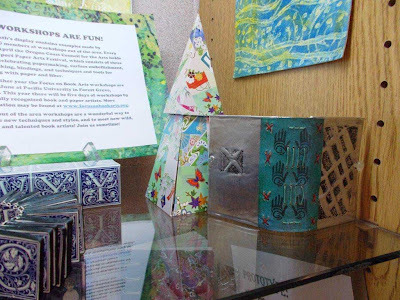 These "out of the area" workshops are a wonderful way to explore new techniques and styles, and to meet new wild wacky, and talented book artists! Join us sometime! Our book this month was inspired by the illuminated manuscripts of the middle ages. Many of those handmade books had decorated margins, marginalia or elaborate first letters created in beautiful colors and real gold and silver. We will be using metallic paints or gold and silver stamps to suggest this same idea. We will decorate our papers, before folding, with stamping in gold and silver. Then we will sew our pages onto the spine of an accordion. These books can be made in a variety of sizes and shapes depending on the size of your starting paper and your own preferences. The one we will be making is about four and a half inches by seven and a quarter inches and will be in cool colors: blues, greens and purple. 2 covers: 4.5" high by 7.25" wide, with the grain going up and down on the short side. Mat board, cereal box cardboard, or any similar pasteboard will work. Cover the cardboard on one side with a decorative paper and wrap the edges over and onto the back, covering at least a half inch around the edges. 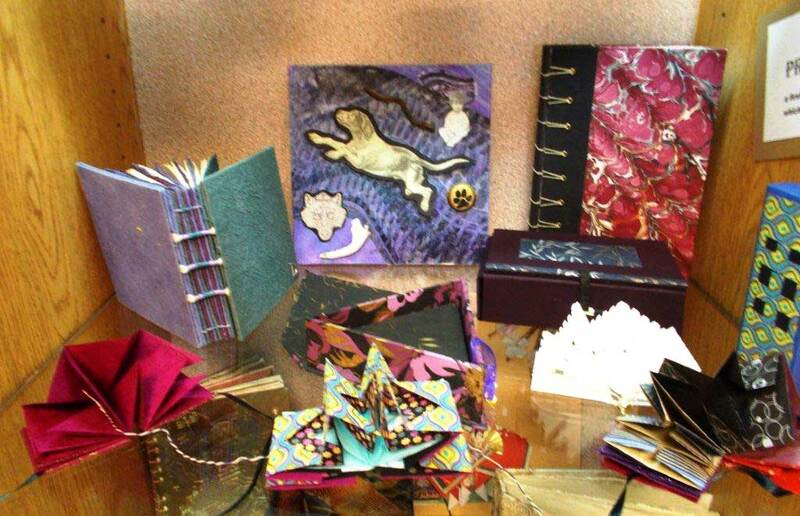 The materials I provide will make the inside cover, spine, and pages. Please note: An RSVP is required by July 10 for this workshop. Check your newsletter for contact details. We'll be meeting at the usual time in our usual location. There will be a $1.50 fee for materials.